Nike is continuing the “Bleed Blue” advertising campaign in India with “Bleed Blue Pledge”, a 60 second television commercial featuring elite athletes from Team India. Members of the Indian Cricket Team (Zaheer Khan, Virat Kohli, S. Sreesanth, Sachin Tendulkar, M.S. Dhoni, Yuvraj Singh and Gautam Gambhir) articulate their passion for cricket in India, pulling back the curtain long enough for the viewer to witness how the game is played, loved and revered from the perspective of the athlete. The ad is part of an online and experiential campaign online at www.nikecricket.in and Facebook. Meshed with scenes of real match play, “Bleed Blue Pledge” features elite cricket athletes like Zaheer Khan, Virat Kohli, S. Sreesanth, Sachin Tendulkar, M.S. Dhoni, Yuvraj Singh and Gautam Gambhir describing the tenets of their game. They dominate to the point where their opponents fear them. They approach the game head on. They break boundaries and achieve dreams. They banish fear, pain, and most of all: excuses. They give their heart and soul to the game of cricket, understanding that they are not only representing their team, but that they are speaking for entire nations who have become unified by a common love. 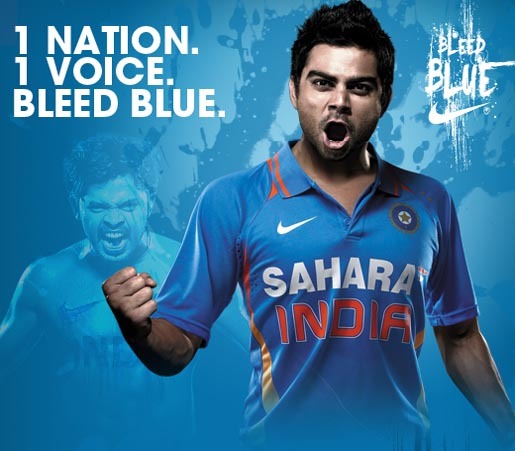 “Bleed Blue” brings to life the passion and obsession for the sport shared by Team India’s players and their fans through consumer events, grassroots outreach, and social networking. Fans can continue to “Bleed Blue” and follow the latest on Team India through Nike’s YouTube channel featuring candid interviews with Zaheer Khan, Virat Kohli, and Sreesanth, and the official Bleed Blue fan, Goonj. “Bleed Blue” has encapsulated the fervor for cricket in India by collecting over 11 million handprints via an innovative digital and events campaign that asked fans to express their loyalty to the team by simply marking their handprint in blue. 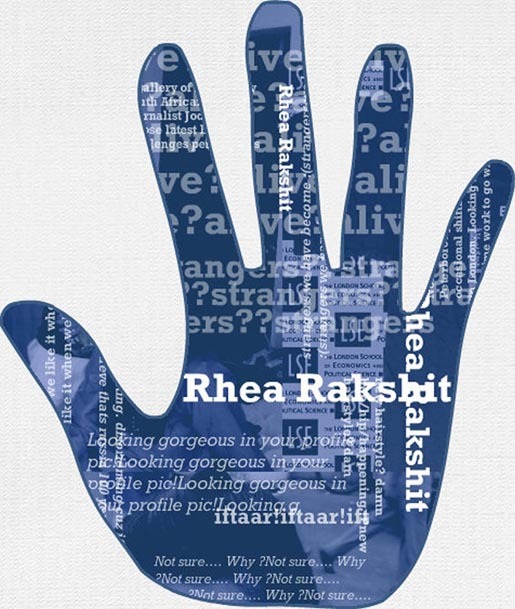 Fans were then able to post their unique handprint to their Facebook page to share with friends and with India’s men in Blue. Artists are invited to contribute their interpretations of the “Bleed Blue” theme, hosted on the Bleed Blue online gallery, “Be True to Blue”. Nike used the match between India and Australia, in the World Cup Quarter Finals, to launch Team India’s Considered team kits, made from recycled plastic bottles. 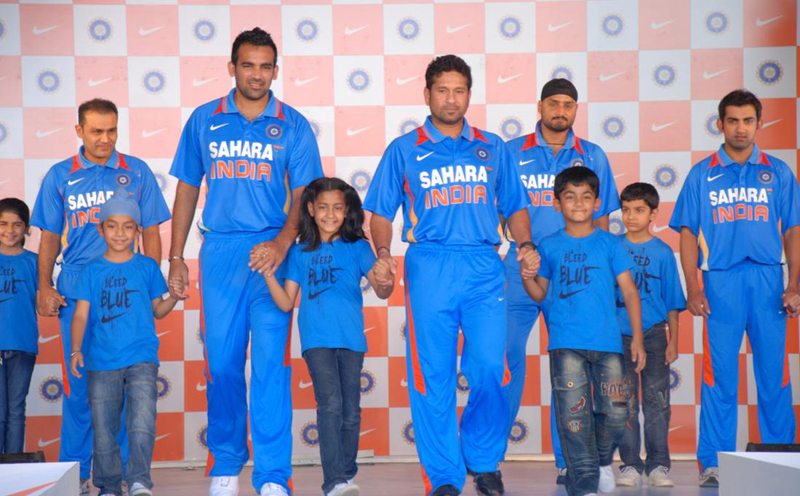 Team India will be seen sporting Nike’s Considered team kits made from recycled plastic bottles. 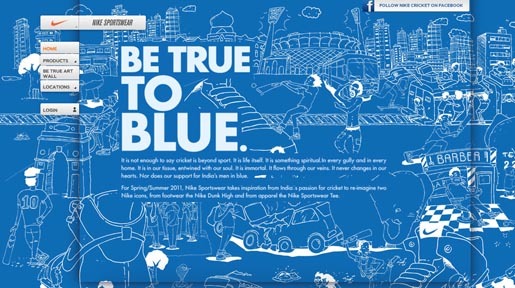 The Bleed Blue Pledge commercial was developed at JWT India, Bangalore. The interactive campaign was developed at AKQA Shanghai.